It’s dead in the middle of winter and there are no fresh okra at the market these days. Or so I thought. They’re around, albeit pricier than usual, and who knows where they came from, but I found them at the store last week and this recipe immediately came to mind. If you know me, you know I love pickles and I love okra too, so this condiment-slash-side dish is just perfect. These are probably better pickled during the summer months, when okra are actually in season, but making these garlicy spears now is fine if you’re craving a taste of summer. Just make sure to use fresh, not frozen okra. They’re excellent alongside sandwiches or as a cocktail garnish. Oh, and straight out of the jar works too. 1. 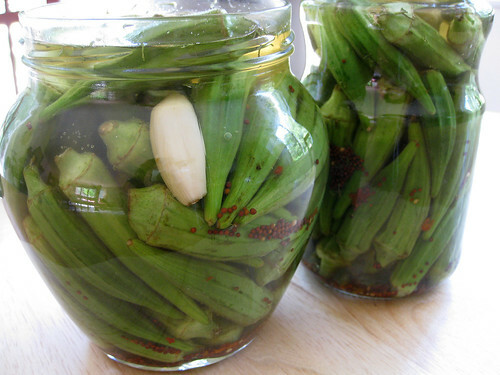 Divide okra and garlic evenly among 2 (2-pint) jars. 2. Combine vinegar and remaining ingredients in a saucepan; bring to a boil. Cook 1 minute or until sugar dissolves. Remove from heat; let stand 5 minutes. Carefully pour vinegar mixture into jars, leaving about 1/4 inch at top. Seal jars; refrigerate at least 3 days and up to 1 month before serving.